Ubumuntu, meaning kindness, humanity, or greatness of heart. In the context of the genocide it has been used to describe the rescuers that saved others at a great personal risk. As an emerging museum professional I find it very important to visit museums whenever I am traveling. This allows me the opportunity to see common trends and innovative ideas within the museum field. I find this additionally valuable when traveling internationally to see how museums across the globe are presenting their materials. Over my next four posts I will be writing about four different museums in Rwanda, Zanzibar, and South Africa to see how these museums have handled difficult topics, dealt with controversy, and presented their collections in innovative and interesting ways. To inform and educate visitors about the causes, implementation, and consequences of the genocide, and other genocides throughout history. To teach visitors what we can do to prevent future genocides. To provide a documentation center to record evidence of the genocide, testimonies of genocide survivors, and details of genocide victims. To provide support for survivors, in particular orphans and widows. The memorial has three permanent exhibitions. The first, The 1994 Genocide Against the Tutsi, details the causes of the genocide, the horrors of the planned genocide, and the restorative justice and reconciliation of the post-genocide era. The second exhibit space, entitled Wasted Lives, documents the other genocides around the world. The third, The Children’s Room, is a memorial to the children murdered during the genocide and the futures lost with them. In addition to the exhibition space is the Burial Place and the Gardens of Reflection. The memorial has made a point of being a welcoming space for survivors and the families of victims. The memorial is donation based and allows for a variety of different experiences. Through my research prior to arrival I had already decided I would be taking an audio tour. I decided on this experience for two reasons. One, because I knew the audio tours were a huge support for the memorial, and two, because I had never taken an audio tour before and after spending a fair amount of class time looking at them I felt I should experience one. I have always shied away from audio tours and saw them (unfairly, I’m sure) as an amateur way to experience a museum. 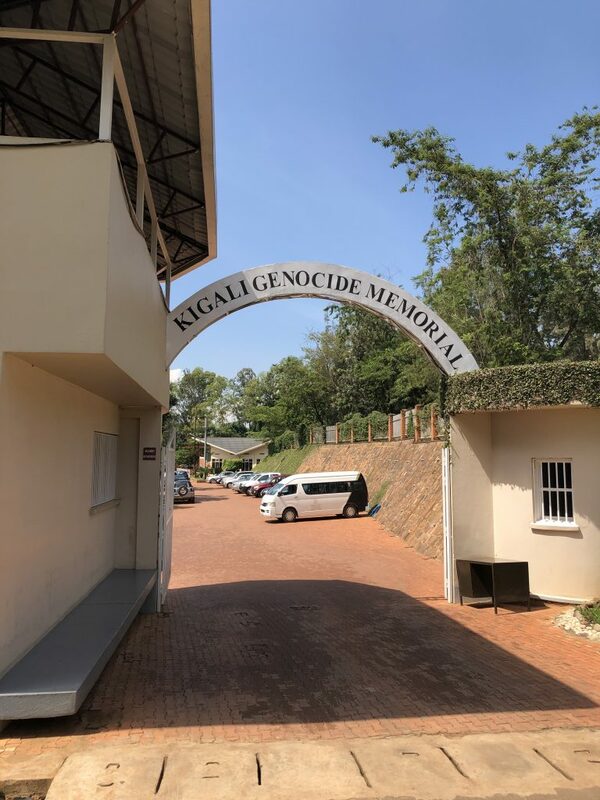 However, I am very glad I chose to take an audio tour for the Kigali Genocide Memorial as it provided much more than supplemental materials but rather drove the intended narrative. Included in the (high by Rwandan standards) price of the audio tour was a rose to place upon the mass tombs and “Ubumuntu” pin. The audio tour leads visitors through the gardens and Burial Place first. However, because we worried about time we chose to skip ahead and enter the museum space first. 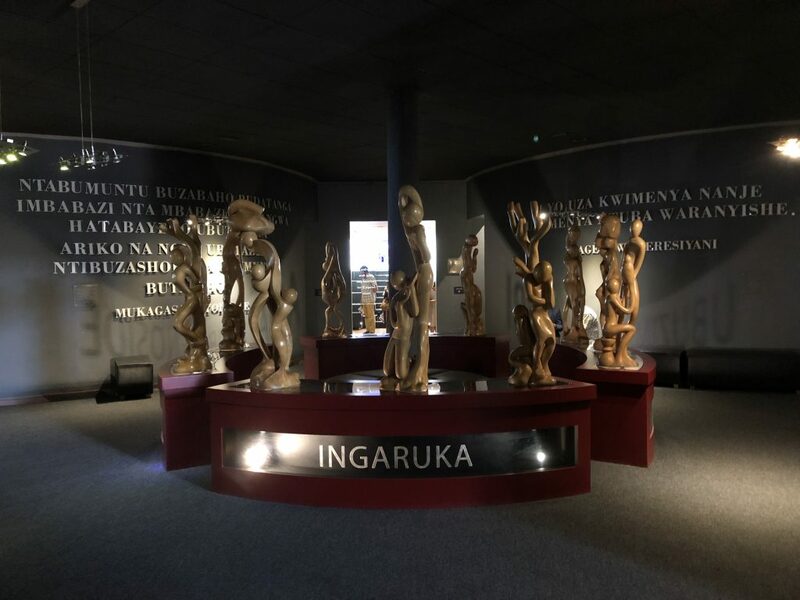 The first exhibition on the 1994 genocide occupies the entirety of the first floor, and is fashioned in a way that visitors will move around the outside of a central room containing a memorial sculpture. At three intervals visitors will encounter an opening in the exhibit materials that both allows them to look into the central room and out towards a flight of stairs leading to a stained glass window but no exit. 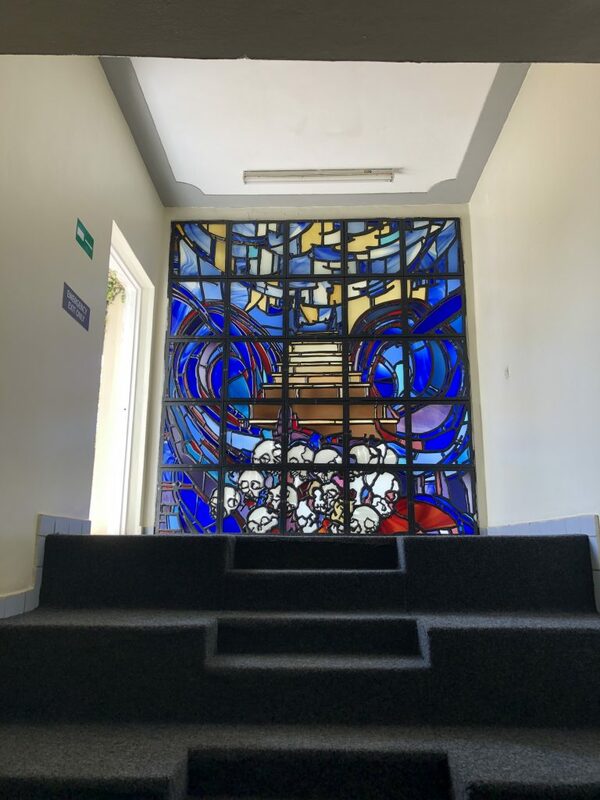 The stained glass pieces are meant to represent the different ways in which the genocide could have been prevented or stopped but weren’t. Finally, the last flight of stairs at the end of the exhibit is unblocked and represents the future for Rwandans. The memorial uses not just the written and digital aspects of the exhibit but the actual physical space itself to tell the story. 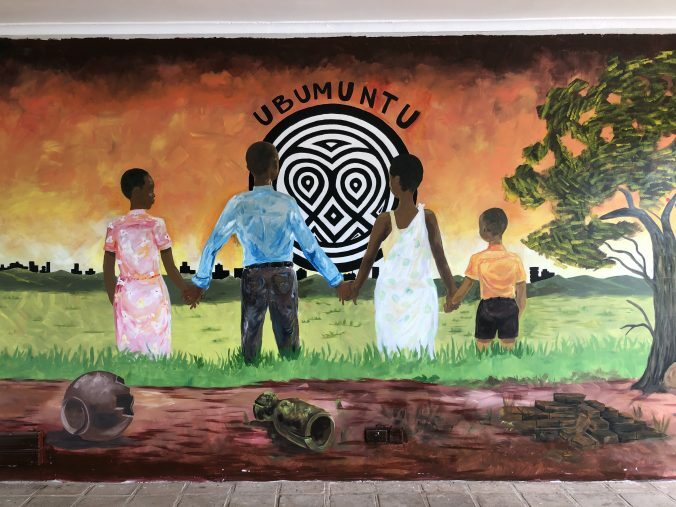 This first exhibit was the largest and told the story of the 1994 genocide by first describing pre-colonial Rwandan society and the affects of colonization. As someone who grew up in the Western world I am so used to hearing histories told from the colonists view. I was most impressed by how the memorial made it very clear that the genocide was directly the result of colonial influences going back over a century. I was shocked to learn that the designation of Tutsis and Hutus were not tribal affiliations but social classes created by Belgians based on arbitrary differences such as the size and shape of your nose and the amount of cows you own. Additionally, the exhibit made clear the ways in which the internationally community failed Rwanda prior to and during the genocide. While much of the exhibit focused on the causes of the genocide, the memorial did not shy away from showing the horrors and atrocities of April to July 1994, particularly those acted upon women and children. Sections of the exhibit were beyond difficult and at one point I had to stop to take time to compose myself. It was hard to understand how anyone, let alone friends and neighbors, could commit these violent crimes. But, this reality is another fact the memorial attempts to drive home, by the end of the genocide it was estimated that over one million people, or 1/5 of the remaining population were potentially culpable. Instead of condemning those that took part, the memorial attempted to show what conditions could lead to a neighbor killing their neighbor. The two exhibits in the second floor of the inside space were much smaller than the first. However, The Children’s Room, was likely the hardest and most moving section of the whole memorial. The space started with a small sign, a message for the child victims, “children, you might have been our national heroes…” Inside the rooms were large pictures of children, the labels juxtaposed personal details like their age and favorite foods with their last words (cries for help,) last memories (watching their mothered murdered,) and ways in which they were murdered. At the end were cloths lines along which survivors could post photos of their lost loved ones. It was a painful room. It was particularly hard knowing those children would have been around my age now. When I was enjoying my idyllic childhood, a child just like me was facing genocide. The final section of the memorial looked at post-genocide reconstruction. After such a difficult topic this section was inspiring and uplifting in its depiction of how Rwandans were able to use restorative justice as a form of reconciliation through their Gacaca Courts. Gacaca, meaning “justice amongst the grass,” in a traditional communal justice system that was adapted to try more than 1.9 million cases. The courts are meant to promote communal healing and present opportunities for truth-telling that allowed many survivors to find the bodies of their loved ones. The exhibit depicts Gacaca as a success that has paved the way for peace in Rwanda. And as an outsider, I was struck by how at piece Rwanda seems, and what a huge capacity for forgiveness and healing Rwandans have. But, as we all know, museums are not neutral and oftentimes have an agenda in the stories they choose to tell. Although the memorial presents a very positive image of post-genocide Rwanda, conversations with others paints a less rose-colored view. Regardless, the memorial pushed their story of forgiveness and healing through the rest of the exhibit spaces as well. I left feeling drained but also positive and in awe of the Rwandan people. I would hope that the forgiveness and community healing is real but struggle to see how it could be. How is the Government Shutdown Affecting Museums?